It’s November again and the next couple of weeks will be busy with finishing up paintings, framing, cleaning house, and that sort of thing as I prepare for this year’s studio tour in our little town of Otterville. Where is Otterville you ask? We are quite close to Norwich, Delhi, and Tillsonburg, not far (half an hour) from Woodstock, Ingersoll, Simcoe, and Brantford. And we are easy enough to get to (about an hour drive) from London, St. Thomas, Stratford, Kitchener-Waterloo, Guelph, Cambridge, and Hamilton. Otterville has changed a little bit since last year – we have some new landscaping by the falls, generously donated by members of the community. Our beloved corner store, Otterville Variety, closed at the end of summer. Now we have a new store there which just opened a few days ago – Market by the Falls. I haven’t even been in there yet but it looks really nice! Here is our press release for the tour (composed by Shirley Hokke, Sue Goossens and myself). If you keep scrolling, you’ll find a condensed version of the information and a map of the tour – all contained on our postcards which you’ll find at kind local businesses, libraries, and tourism offices. 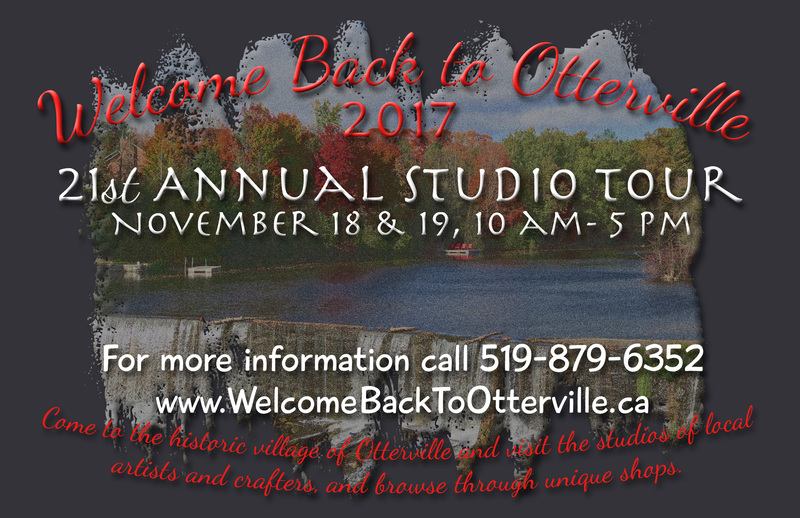 The artists of Otterville invite you to experience a full range of unique artistic visions at the 21st Annual ‘Welcome Back to Otterville’ Studio Tour November 18 & 19. This year, the artists highlight traditional paintings, original mixed media pieces, photography, art cards and jewelry that represent an artistic vision for the meandering spirit. Functional bird houses, outdoor furniture, and engraved items all encompass a wonderful lead in to the winter holidays. You will be pleasantly surprised to find diversity, yet warm hospitality, in the historical village of Otterville. The warm scent of hot apple cider or cranberry wassail brewing, and home baking at some of the studios, adds that extra welcoming touch. Trudy Verberne creates one-of-a-kind greeting cards often with matching envelopes. She is exhibiting with artist Linda Hoffman. Located just minutes away is Shawn Pinnoy, owner of Stix and Skids, selling up-cycled décor including wreaths, bird houses, barn-board signs and much more. Ralph Moore & Sons specialize in birdseed and seed mixtures. They offer a variety of bird-feeders including Droll Yankee, Squirrel Buster, Perky Pet, Pinebush, Going Green, Chapelwood, and some handcrafted by local artists. There is a new studio on the tour this year. Tammy Gould does creative laser engraving. She creates gifts on glass, wood, and metal. Custom designs are available. Jillian and Kaleb Driedger, owners of In Bloom Designs, create handmade bright and earthy jewelry. Their designs feature beautiful gemstones and mixed metals along with exotic and recycled woods. Sue Goossens, Shirley Hokke, Mae Leonard, Linda Hoffman and Lianne Todd are professional artists compelled to create with completely different styles – artists who welcome you into their home studios to share their passion. Sue has a large collection of watercolours both on paper and canvas. Landscape, architecture and a few florals! Shirley paints from her heart in conceptual oils and watercolours. Mae puts her whole imaginative spirit into her acrylic paintings. Linda paints with watercolour and oil on canvas and has a unique creative outlook. Lianne skillfully explores nature’s patterns with vivid watercolours and digital art, in many different and surprising ways. 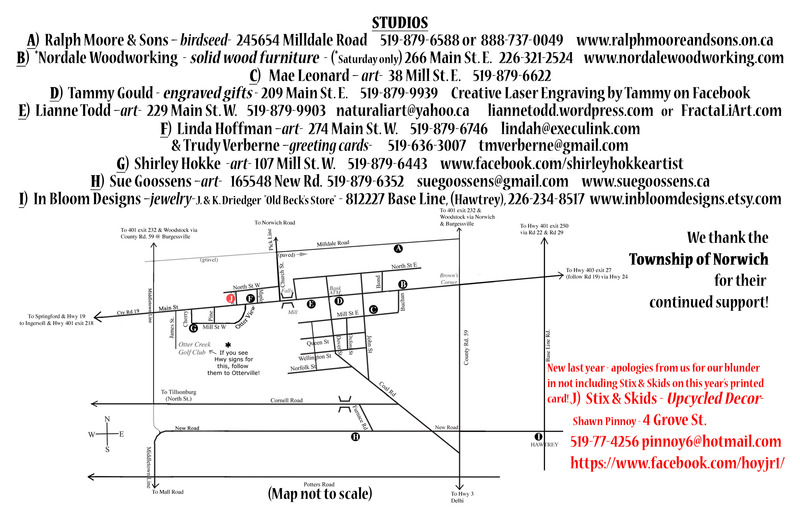 All are welcome to visit each studio in Otterville on November 18 & 19 from 10am to 5pm. Watch for yellow flags at each location. Maps are available online at www.WelcomeBackToOtterville.ca, or pick up a postcard at local businesses. A special thank you is extended to the Township of Norwich. This entry was posted in Art, Tourism and tagged artists, Brantford, Cambridge, exhibition, gallery, London, Norwich, open house, Otterville, Oxford County, shopping, show, studio, Tillsonburg, tour, Watercolours, Woodstock. Bookmark the permalink.